Extreme sports may not be for everybody, but for Riverview resident Tommy Nuttall, they are one of the main parts of his life. Nuttall, or maybe better known by his stage name “Typhoon Tommy,” is a champion jet skier who has travelled the world to compete in places like Turkey and Mexico. 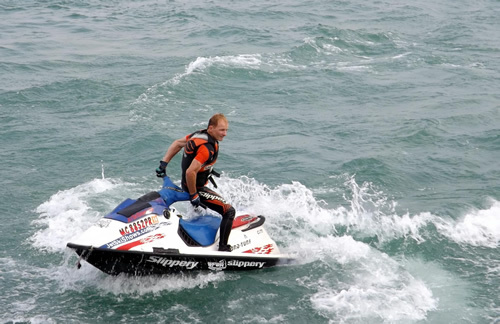 Nuttall started out jet skiing in 1989, although he began competing in ‘91, and he admits that while he took to jet skiing rather quickly, he was still quite bad in the beginning. Chip Gillan, or as Nuttall likes to call him “Chips Ahoy,” was a man that opened many doors for Nuttall and was the one who really got him into jet skiing. “If I wouldn’t have met him, my life could have been very different,” Nuttall said. Life for Nuttall now consists of coaching at Lincoln Park High School, being a personal trainer, and showcasing his skills as Typhoon Tommy at many local and national events. 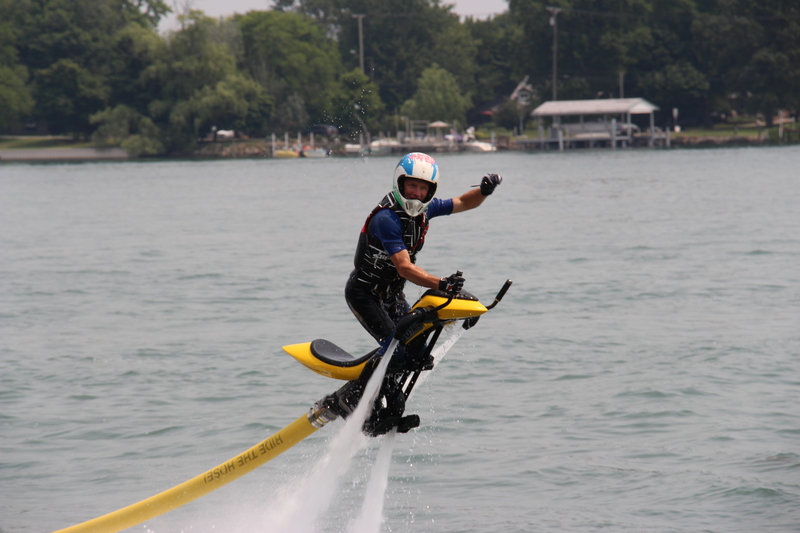 During his performances as Typhoon Tommy, Nuttall not only shows off on the jet ski, but he also uses a jet board, which can propel him up to 40 feet into the air. “We’re still jet skiers, but we’ve all really moved into the hydro flight and jet board side of things,” Nuttall said. Because of his fascinating and unique aquatic performances, he has performed at many Downriver festivals, including Roar on the River. Nuttall loves being apart of Roar on the River, not just because it’s a “great hometown atmosphere,” but because he loves how he’s seen the people and the festival grow year after year. Two jet skiers that Nuttall has specifically helped have been his younger sons Dakota, 19, and Zane, 15. Both of the boys travel with their dad to the majority of his shows and will even perform with Nuttall a lot of the time, though they mostly stick to the jet boards. Although being Typhoon Tommy is not a fulltime profession for Nuttall, he would not give it up for the world. Whether it is jet skiing or jet boarding, Nuttall is just happy with the opportunity to perform at local venues with kids that he’s been able to see improve and mature.